In the beginning of Scott A. Combs' The Kili Wanna Affair: A Galactic Guild Comedy, which is the first book in the George and Sali Adventure series, George Shooters and Sali Terri haven't met yet. Sali, dressed in his new Galactic Guild ensign uniform, enters the planet of Kili Wanna as the Official Military Liaison of Kili Wanna at a time of much rioting. He meets Bethel, an elderly Kili Wannan maid with a whole bunch of responsibilities, and is quickly put to work in the emperor's palace. Then he meets George, who is held captive by the Kili Wannans, and manages to free her by hiring her as his assistant. Together, they must try to get a treaty signed. Their mission, however, gets much more complicated. Though Sali is obviously attracted to George, he tends to say stuff that makes George want to punch him. I had myself a whole bunch of laughs, but at the same time I was enthralled by the finer building blocks of Kili Wanna, the Kili Wannans themselves, and the conflicts that George and Sali were faced with. Combs' imagination must be a limitless universe itself because not even all the jokes and comedic scenes made me disregard his creativity. 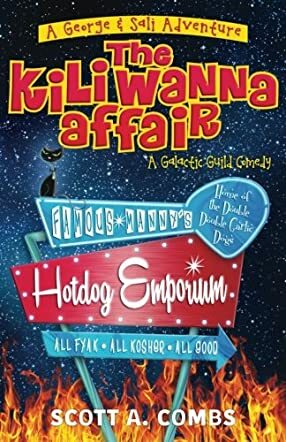 Having integrated hot dogs and funny acting cats among many other things that I can name, Scott A. Combs went and took stuff that people can connect with, added that creativity of his to the mix, and cooked up a science fiction novel that no one will be able to forget.